If I comment the Log line, then the condition applies to the next line, and chances are load() is not called. Are such situations rare enough that I can decide it should not exist? This is on the official checklist, so I guess many people do this on a regular basis. So, how to efficiently but safely remove all Log lines? I find a far easier solution is to forget all the if checks all over the place and just use ProGuard to strip out any Log.d() or Log.v() method calls when we call our Ant release target. That way, we always have the debug info being output for regular builds and don't have to make any code changes for release builds. ProGuard can also do multiple passes over the bytecode to remove other undesired statements, empty blocks and can automatically inline short methods where appropriate. So you would save that to a file, then call ProGuard from Ant, passing in your just-compiled JAR and the Android platform JAR you're using. See also the examples in the ProGuard manual. Update (4.5 years later): Nowadays I used Timber for Android logging. Not only is it a bit nicer than the default Log implementation — the log tag is set automatically, and it's easy to log formatted strings and exceptions — but you can also specify different logging behaviours at runtime. See the Timber sample app for a more advanced example, where all log statements are sent to logcat during development and, in production, no debug statements are logged, but errors are silently reported to Crashlytics. All good answers, but when I was finished with my development I didn´t want to either use if statements around all the Log calls, nor did I want to use external tools. The only thing I had to do in all the source files was to replace the import of android.util.Log with my own class. TAG, "Adding window " + window + " at "
A constraint is that your logging instructions must not span over multiple lines. I would like to add some precisions about using Proguard with Android Studio and gradle, since I had lots of problems to remove log lines from the final binary. In order to make assumenosideeffects in Proguard works, there is a prerequisite. In your gradle file, you have to specify the usage of the proguard-android-optimize.txt as default file. // With the file below, it does not work! The proguard-android-optimize.txt file does not add those lines, so now assumenosideeffects can work. Then, personnally, I use SLF4J, all the more when I develop some libraries that are distributed to others. The advantage is that by default there is no output. And if the integrator wants some log outputs, he can uses Logback for Android and activate the logs, so logs can be redirected to a file or to LogCat. I have used a LogUtils class like in the Google IO example application. I modified this to use an application specific DEBUG constant instead of BuildConfig.DEBUG because BuildConfig.DEBUG is unreliable. Then in my Classes I have the following. 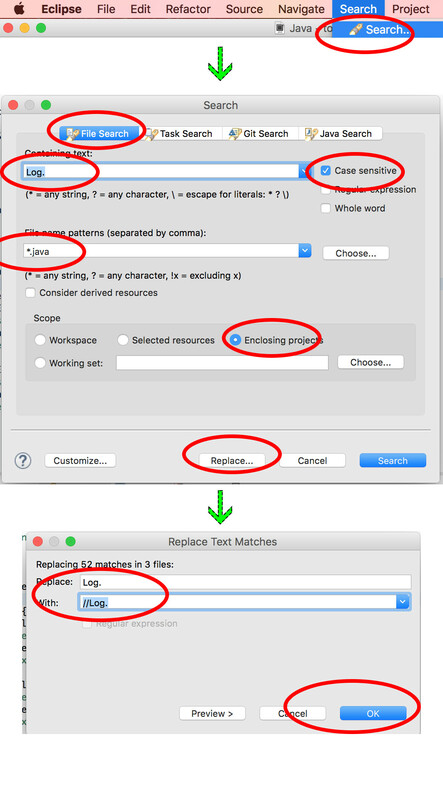 Checks to see whether or not a log for the specified tag is loggable at the specified level. The default level of any tag is set to INFO. This means that any level above and including INFO will be logged. Before you make any calls to a logging method you should check to see if your tag should be logged. You can change the default level by setting a system property: 'setprop log.tag. ' Where level is either VERBOSE, DEBUG, INFO, WARN, ERROR, ASSERT, or SUPPRESS. SUPPRESS will turn off all logging for your tag. You can also create a local.prop file that with the following in it: 'log.tag.=' and place that in /data/local.prop. Click Find and then replace all. Android Studios will now go through all your files in your project and replace all the Logs with Timbers. The only problem I had with this method is that gradle does come up witha million error messages afterwards because it cannot find "Timber" in the imports for each of your java files. Just click on the errors and Android Studios will automatically import "Timber" into your java. Once you have done it for all your errors files, gradle will compile again. This will result in the app logging only when you are in development mode not in production. You can also have BuildConfig.RELEASE for logging in release mode. If you can run a global replace (once), and after that preserve some coding convention, you can follow the pattern often used in Android framework. With Android Studio gradle plugin, BuildConfig.DEBUG is quite reliable, so you don't need extra constants to control the stripping. This is what i used to do on my android projects.. I have a very simple solution. I use IntelliJ for development, so the details vary but the idea should apply across all IDE's. I pick to root of my source tree, right-click and select to do "replace". I then choose to replace all "Log." with "//Log.". This removes all log statements. To put them back later I repeat the same replace but this time as replace all "//Log." with "Log.". Works just great for me. Just remember to set the replace as case sensitive to avoid accidents such as "Dialog.". For added assurance you can also do the first step with " Log." as the string to search. 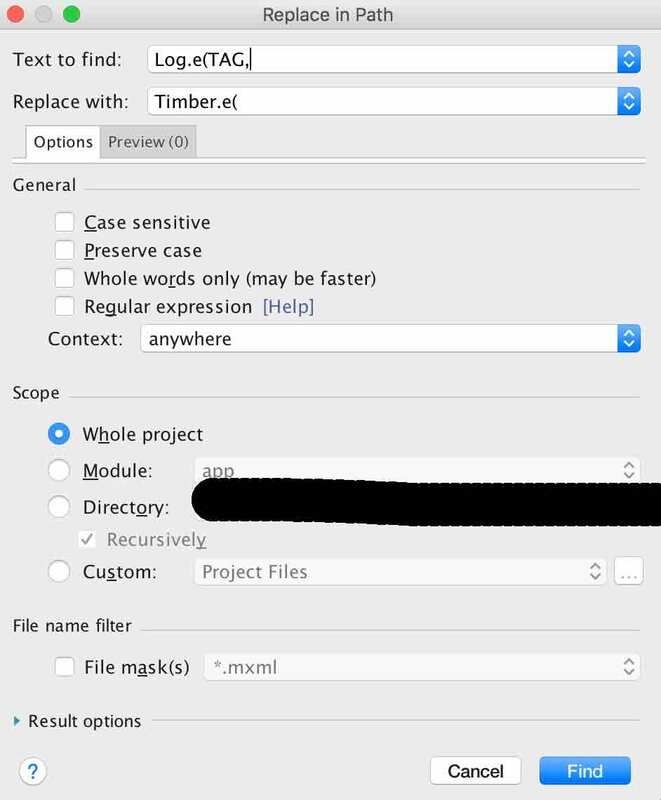 Timber is very nice, but if you already have an existing project - you may try github.com/zserge/log . It's a drop-in replacement for android.util.Log and has most of the the features that Timber has and even more. his log library provides simple enable/disable log printing switch as below. In addition, it only requires to change import lines, and nothing needs to change for Log.d(...); statement. I have improved on the solution above by providing support for different log levels and by changing the log levels automatically depending on if the code is being run on a live device or on the emulator. I like to use Log.d(TAG, some string, often a String.format ()). In this way when you are ready to make a release version, set MainClass.debug to false! Works for multiline logs. In this solution you can be sure, that logs are not present in production code. All logs are disabled by DebugLog when the app is released. Not the answer you're looking for? Browse other questions tagged android logging proguard android-log or ask your own question. Android what's the best way to hide logs? Released app displays debug strings? How do I enable/disable log levels in Android? How to disable Firebase Crash Reporting when the app is running on debug? Removing Logging from Production Code in Android? Should I comment my log calls when creating my final package? How do I log a Python error with debug information? What does this Google Play APK publish error message mean? Is it allowed to have any logging on Android Public release?